Compare Small Wireless Speakers: Bose, Logitech or Sony? Remember the old times when, to enjoy your favorite music during a picnic or simply relaxing in your backyard, you had to carry along a large portable radio-cassette or CD set? Well, those days are gone! Nowadays, when you want to enjoy the outdoors and music, all you have to do is download your favorite music into your smartphone or smart tablet and take along a tiny Bluetooth wireless speaker that can beautifully render the music produced by the smartphone or tablet. 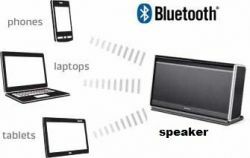 Bluetooth is a wireless data transmission technology that allows the transfer of voice/music/video data between two or more devices that are close to each other. The maximum distance that can separate the two devices may vary between 30 to 50 feet. Bluetooth finds its most common application when used with smart devices (such as smartphones, tablets and laptops) transferring voice and music data between the smart device and some nearby equipment such as a Bluetooth enabled wireless speaker. But if you want to get one of these Bluetooth speakers, the first thing you will notice is that there are quite a few products out there to choose from, each offering different capabilities. This review will compare some of the best and most popular small wireless speakers bought by Amazon customers to help you decide which one to get. Note that the above selected three Bluetooth wireless speakers are not only the most popular among Amazon customers, but also among the best available today. All three brands have received an average of 4.5 stars (out 5 stars) from Amazon reviewers! While Bose SoundLink III corresponds to excellent high-end products in the wireless small speaker sector, Logitech UE MINI BOOM and Sony SRS-BTV5 are good examples of more affordable very small speakers that still offer more than adequate sound and a number of useful features. This particular selection will provide you with product information at both ends of the wireless speaker market, and will allow selection of the best brand and model corresponding to your personal needs and pocket. The three Bluetooth speakers selected for review here are all compatible with Bluetooth supporting Android and Apple devices (smartphones, tablets, and laptops). Note: Pairing a Bluetooth device like a speaker with another Bluetooth device like a smartphone is extremely easy, and it needs to be done only once as the pairing information is memorized by both devices. Usually, all you have to do is press and hold a Bluetooth button on the speaker and then choose the id associated with the speaker displayed on the smartphone. That's it! Simple and quick. This procedure may slightly change depending on the devices you are pairing, but it is usually very simple and clearly explained in product documentation. For instance, the Sony SRS-BTV5 speaker can also be paired using the NFC (Near Field Communication) technology that enables pairing between Bluetooth devices that support NFC just by tapping a specially identified location on the devices. This makes the pairing even simpler. You will find below a comparison table for the selected Bluetooth speakers. Please read the following notes for a better understanding of each speaker's capabilities. Bose SoundLink III: This speaker provides the best sound you can find today in the small size wireless speakers category. Using advanced Bose technologies, it plays louder and longer than its predecessor SoundLink II, reproducing perfectly the fullness, clarity and depth of the music.The best part is that even when played very loud no distortion is noticeable. This is partly due to the sound processing software that is built-in and that enhances the quality of the outgoing sound. The speaker can play surprisingly loud for its size and definitely louder than any other comparable speakers with no noticeable distortion, vibration or shaking. 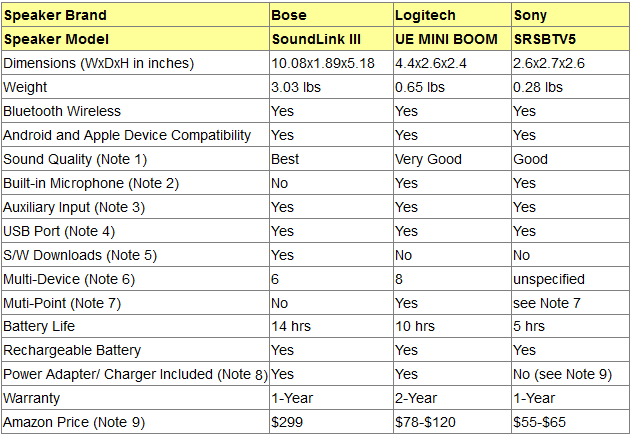 Logitech UE MINI BOOM and Sony SRS-BTV5: Being even smaller than the Bose SoundLink III and Jawbone Big Jambox, Logitech UE and Sony SRS-BTV5 should not be expected to achieve similar sound volume levels. But with the new Logitech UE MINI BOOM (which replaced the old Logitech UE 984) the sound is surprisingly powerful and clear for a small speaker. In particular, the sound is noticeably richer and has a deeper bass than the older UE 984. Note that with these small speakers the sound quality is best in the middle volume settings and slightly deteriorates at high settings. Note 2: Logitech UE and Sony SRS-BTV5, all have a built-in microphone which allows hands-free phone calls when your smartphone is Bluetooth connected to the speaker. This feature is not offered on the Bose SoundLink III speaker. With the Bose SoundLink III, when there is a phone call on the smartphone connected to the Bose speaker, the audio source is interrupted and the call is played through the phone only and not through the speaker. When the call ends, the music starts again automatically through the speaker. Note 3: The auxiliary input allows connection of other non-Bluetooth sound devices to the speaker. Note 4: All three speakers considered here come with a USB port, but their use is quite different: With Logitech UE MINI BOOM and Sony SRS-BTV5 speakers, the USB port is used only to charge the battery. With Bose SoundLink, the USB port can also be used to download new software to the unit to keep it up to date. Note 5: Only the USB port on the Bose SoundLink III allows software downloads to the speaker to update the unit's software with the latest features and bug corrections. Note 6: This refers to the number of smartphones, tablets or computers that can be programmed into the speaker for Bluetooth wireless communication. Though the Sony SRSBTV5 speaker does not specify the number of devices that can be programmed, users were able to program at least their smartphone, laptop and tablet. Note 7: This refers to the number of smartphones, tablets or computers that can simultaneously be connected to the speaker allowing music being streamed alternately from any one of them. Logitech UE MINI BOOM allows simultaneous connection with up to two devices. Bose SoundLink III does not provide this feature. Also, on Sony SRS-BTV5, when the NFC technology (explained above) is used for pairing the speaker with your device, the multi-point connection feature is not available. Note 8: The Bose SoundLink II and Logitech UE speakers all come with AC wall chargers/power adapters. The AC wall charger for the Sony SRSBTV5 is optional and can be obtained separately. Note however that the Logitech UE and Sony SRSBTV5 speakers can also be charged by connecting their supplied micro-USB cable to the speaker, and then connecting the other end of the cable to a computer. All three speakers provide also optional car chargers for charging your speaker while on the road. These car chargers need to be purchased separately (see below under Amazon products section). Note 9: All prices are approximate as they can change for one day to the next. Also prices may vary depending on the color chosen. Note that Amazon often provides a good discount on the List Price of sold products. So which speaker to buy? If the priority for you is getting the wireless speaker that produces the best sound with no distortions even when played very loud, then you should consider the Bose SoundLink III. Remember though that it does not have a built-in microphone, and therefore it does not support hands-free phone calls. If you don't want to spend as much, and you still want to have a wireless speaker with adequate quality sound, then consider either the Logitech UE MINI BOOM or the Sony SRS-BTV5. We prefer the surprisingly good sound quality of the Logitech UE MINI BOOM over the Sony SRS-BTV5. Note that these speakers are smaller and lighter than the Bose speaker. This has the advantage of making them easy to carry, but also the disadvantage of not being able to produce as big and perfect a sound as the Bose speaker can, even though the Logitech UE MINI BOOM sound comes very close. Also, keep in mind that even though both the Logitech and Sony speakers have built-in microphones that allow hands-free calls, their USB ports can only be used to charge the battery and can not be used to software upgrade the units. The Bose SoundLink Mini II speaker is a smaller and lighter version of the Bose SoundLink III speaker. The sound quality is still very good. It delivers full sound with dramatically deeper lows than you'd expect from a speaker that fits in the palm of your hand. It has a built-in speakerphone, so you can take calls out loud with clear sound. And voice prompts talk you through Bluetooth pairing, so connecting to your music is easy. The lithium-ion battery provides up to 10 hours of unplugged playtime, and it can be charged from most USB power sources. It comes with a charging cradle, wall charger and cable. At $100 less than the SoundLink III price, it is definitely worth considering. Note that you will be getting a choice of colors when you click below. A more recent speaker from Logitech with amazing features! Waterproof, shockproof, designed for adventure. Insanely good, loud 360 degree sound with deep bass. Tap the speaker to play, pause or skip songs. Portable design so you can bring the music anywhere. PartyUp from Ultimate Ears allows you to wirelessly connect more than 50 UE speakers. 15-hour battery life and 100 ft. Bluetooth wireless range. Say it to play it with Siri and Google Now voice integration. ​Comes in various colors (colors offered when you click the Amazon link).